So much happened today: The Heat won game 7 of the NBA finals; Patriots’ Tight End, Aaron Hernandez is now a suspect in a murder trial; and Paula Deen admitted to using the “N” word. With so much material to work with, I could write plenty about one or all of these events and, of course, accompany my thoughtful commentary with a sad cartoon. However, currently at the forefront of my mind is the fact that I have to get up super early tomorrow. 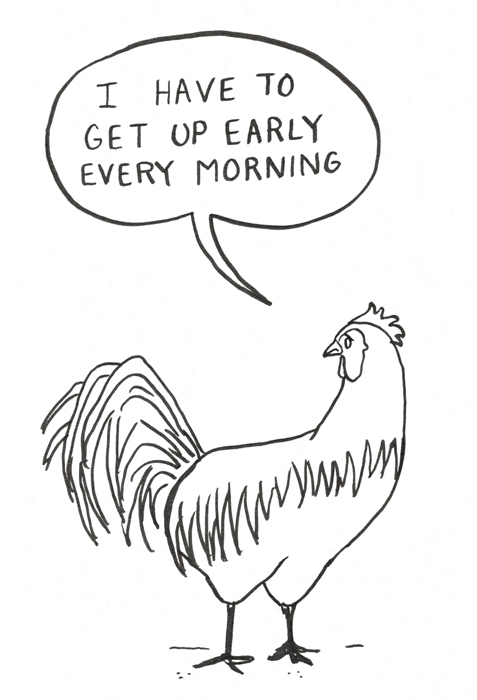 So, instead of ranting about the craziness of the day, I’m posting this rooster with whom I empathize. This entry was posted in Uncategorized and tagged Aaron Hernandez, Game 7, NBA Finals, Paula Deen, rooster, sadsadsad. Bookmark the permalink.